I’ve been holding out on you. I have been secretly behind your back, have been making another kind of breakfast besides pancakes. Yes, I’m sorry, please forgive me. It all started back in May when I was in Lake Tahoe. The the hotel I was staying at had an omelet bar and ever since than I have been hooked. I tried making omelets for years and I always ended up with scrambled eggs. I watched the chef make the omelets and I watched everything he did, taking it all in. I decided to come home and start practicing. Now that I got it down pat I thought I would show you. So today’s lesson is making an egg white omelet. 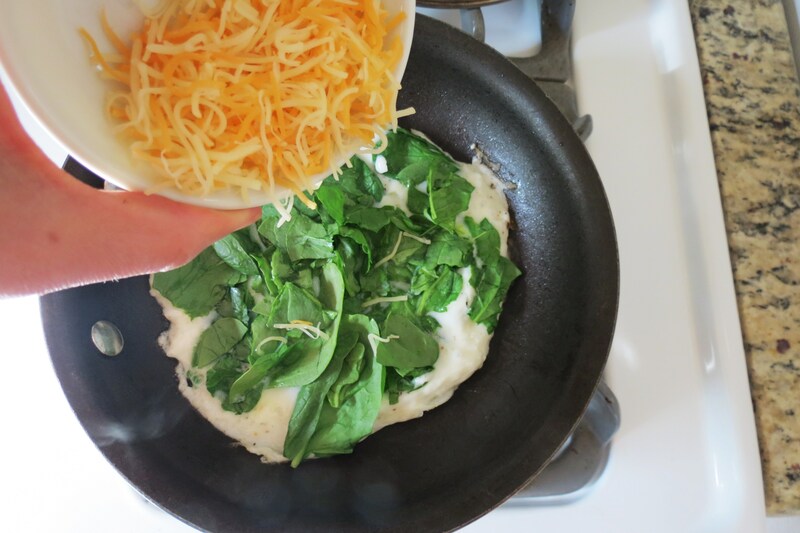 Today’s omelet is a simple one, Spinach and Cheese. 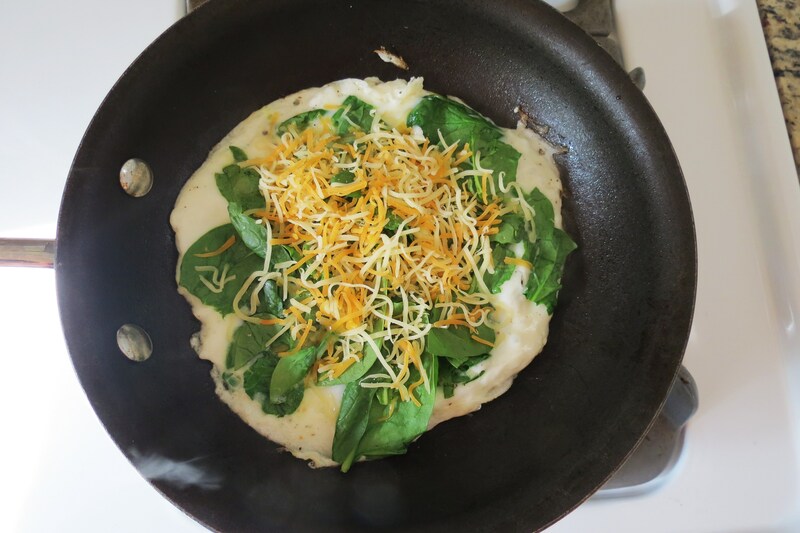 First off my ingredients, I used three egg whites, 1 tablespoon of milk, dash of pepper, handful of spinach and a 1/2 oz of lite shredded cheddar cheese. 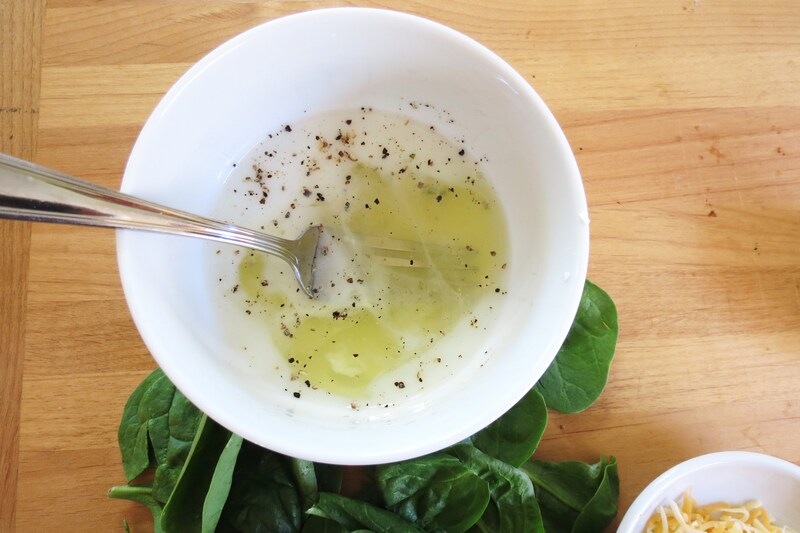 With a fork beat the eggs, milk and pepper together. 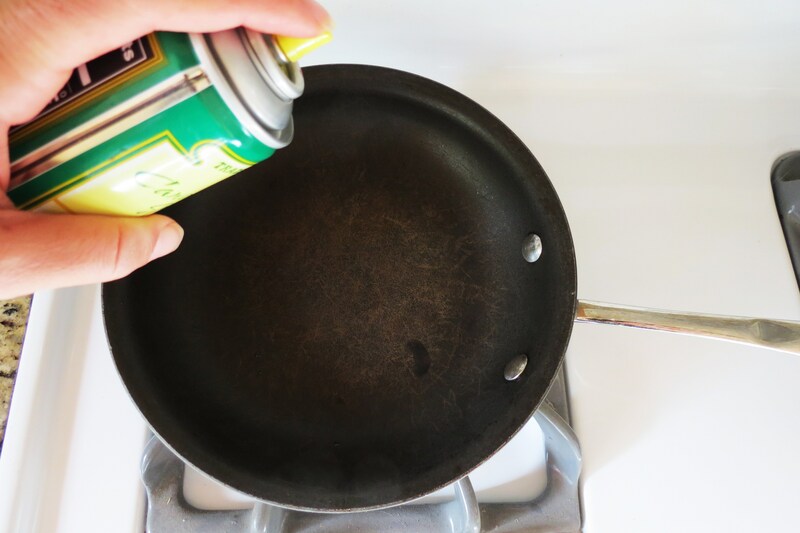 Spray a skillet with non-stick spray, I used Canola Spray. 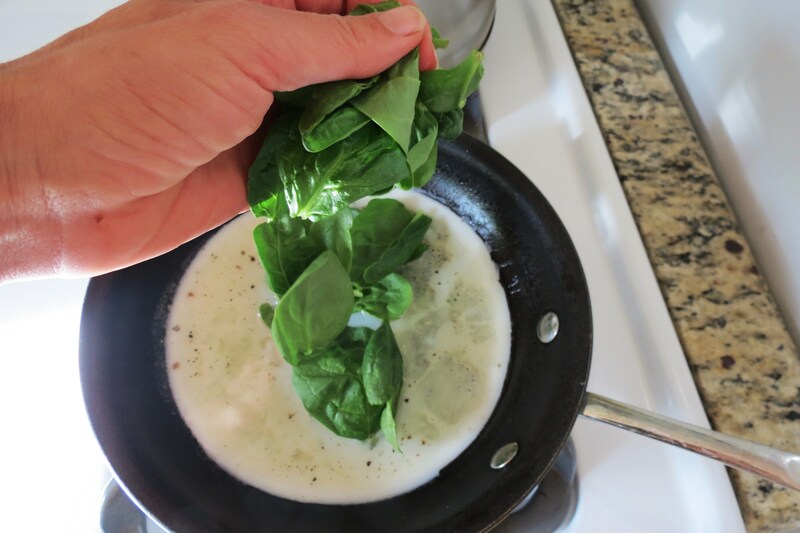 Heat the skillet for about 30 seconds than add your egg whites. I let the eggs cook for about 30 seconds more than I added the spinach. Be sure to cut off the stems of the spinach, and I also kept some leaves in tact and ripped up the others by hand. Than I carefully lifted up the sides of the egg with a spatula and tilted the pan so the egg whites on top would run off, to insure even cooking. I did this on several of the sides. Once the middle started to get firm, I sprinkled on the cheese. 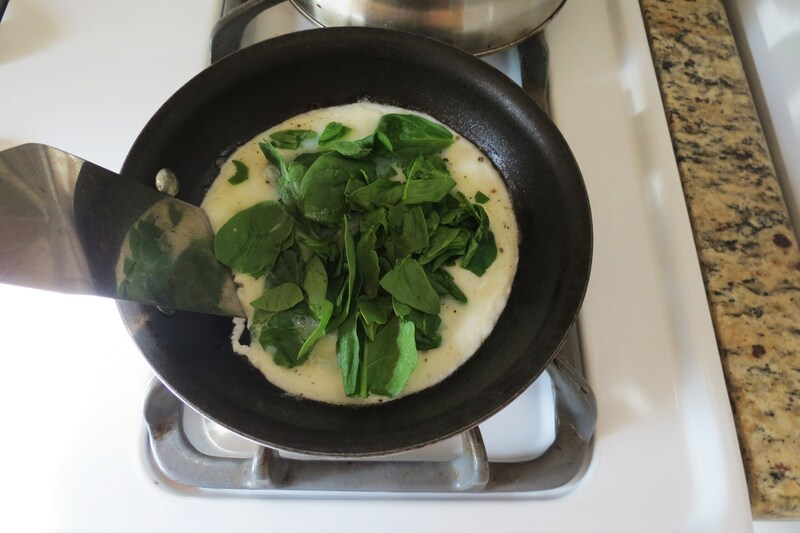 At this point you can see the eggs are firming and the spinach is starting to wilt. I like to shake the pan to make sure the bottom isn’t sticking. Makes it easy for the omelet to slip out. 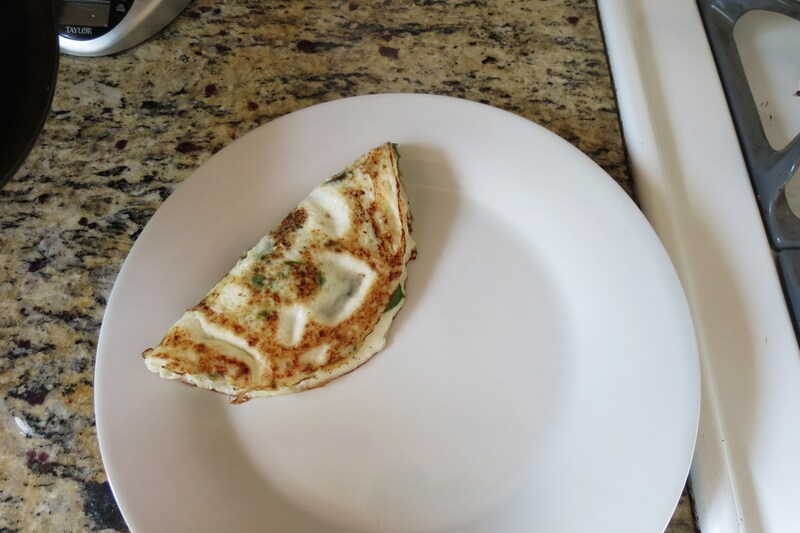 Once the center is set and the cheese is pretty much melted, you get your plate and carefully slide the omelet out of the pan and place onto a plate. Using the edge of your skillet, you fold over the egg to make a half moon shape. Ta da! Now you have an omelet! Pretty simple! I was always intimidated making omelets but not anymore. I love making them and the whole process only takes a few minutes!! You can add anything you want to an omelet such as other vegetables, bacon, ham, chicken, cheese, salsa, jalapenos, mushrooms, oh the possibilities are endless. I thought I would share with you a few omelets I made while practicing. All the basics of the recipe are the same as the Spinach and Cheese recipe, I just switched up the filling of the omelet. Here is my first omelet ever. The second omelet is a Mexican Omelet. 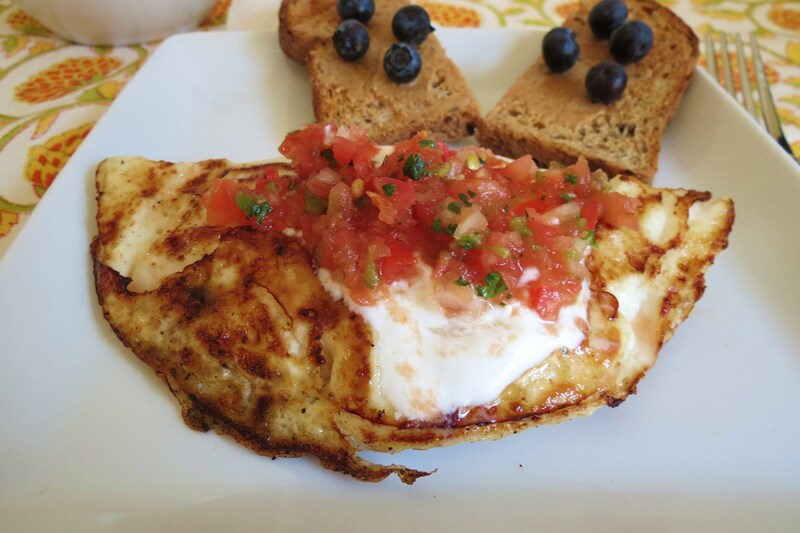 I topped the omelet with a dollop of greek yogurt and salsa. 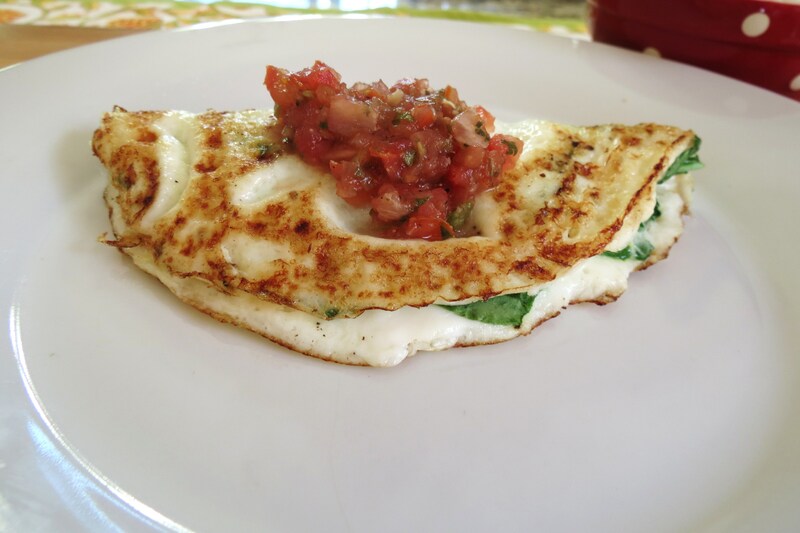 The salsa on an omelet made is so creamy, almost like it had a ton of cheese in it! A little background on the salsa. My friend Andrea has a friend named Chris who is starting a business making homemade salsa and rubs. He was nice enough to give me a sample. His salsa was amazing!!! I am looking forward to trying his rubs, but he didn’t have any at the time, because he went to an event and sold out completely. I heard there out of this world! Maybe he’ll be nice enough to let me try them when he makes them again, and maybe he’ll let me give some away? Well see. I know he is going to do great!! I really love supporting my locals and small business’s. The food always tastes so much better, wouldn’t you agree? By the way, if you want to check him out go to Caddy Shack Foods. You’ll notice my omelets are all topped with his fantastic salsa. Ingredients: 2 Tablespoon salsa, 1 tablespoon of pepper jack cheese topped with 1 tablespoon greek yogurt and 2 tablespoons of salsa. Next up is Broccoli, Pepper and Onion Omelet, I may have filled it a little too much with peppers, but I’m not complaining! I like my vegetables more on the crunchy side, but if you like yours more tender, I would recommend cooking them first than adding them to your omelet. Oh I thought I should show you what the Spinach and Cheese Omelet we made together today, looks like on the inside. Oh and the liquid in the middle is just the salsa pouring down. I should have showed you first before topping with salsa. 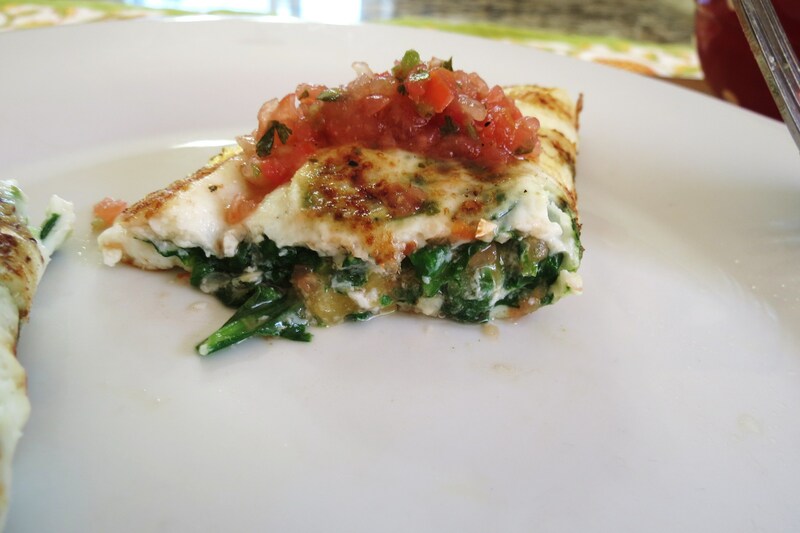 A healthy egg white omelet filled with cheddar cheese and spinach. Spray a 6-8" in skillet with cooking spray and set on the stove on medium heat for 30 seconds. Meanwhile in a small bowl add egg whites, milk and pepper and whisk until combined. 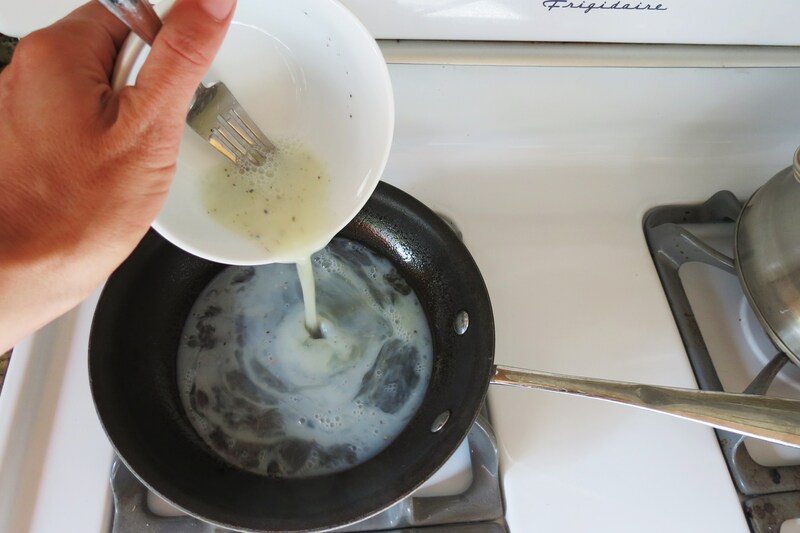 Pour egg mixture into skillet and tilt the pan to spread the egg mixture evenly. Add the spinach. Let eggs firm up a little, and after about 30 seconds use a spatula to gently direct the mixture away from the sides and into the middle. Allow the remaining liquid to then flow into the space left at the sides of the pan. Continue to cook for another minute, add the cheese and cook until the center is firm and cheese is almost melted. I like shake the pan a bit to make sure it doesn't stick. Holding the pan above the serving plate, tip it so the omelette rolls off, folding itself onto the plate. You know the egg is done when it is no longer runny. Well my Friends, I hope you liked your cooking class for the day! I had fun!! Sorry for not having great pictures, but I had to do it one-handed and I am just not that talented to cook and photograph at the same time. So here is your homework! Tell me, do you make omelets? 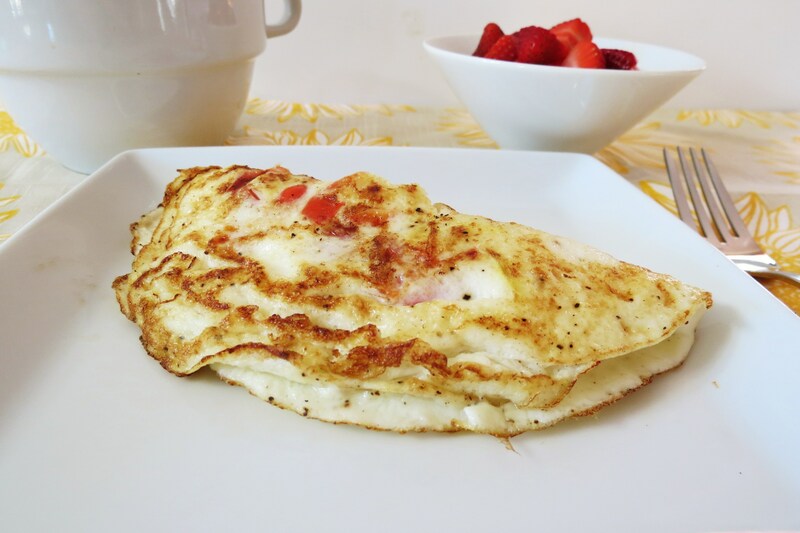 What are your favorite kind of omelets? Ok, you have your homework now, so have a wonderful Sunday and I’ll see you back here tomorrow. I’ve always been pretty pathetic at flipping omlets and pancakes for that matter…time to take a lesson! I just made a tomato, mushroom, and cheddar cheese omelet for breakfast! So delicious. The only difference in my “omelet cooking style” is to fold it over in the pan so all the ingredients melt together.. Mmm mmm. That sounds fantastic!! I’ll have to try folding it in the pan. How many eggs do you use? 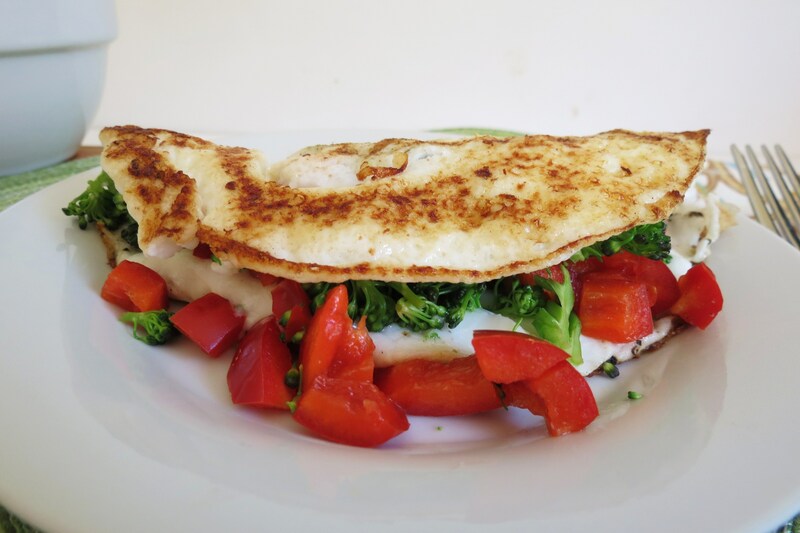 Your omelet looks so beautiful, and healthy too!! Wanna come make on for me?! 🙂 It is a BEAUTIFUL day outside, & I’m stuck studying for my finals all day booo. Have a great Sunday! Sure I’ll come over, your not to far! 🙂 Are you getting the heat yet? Out in the East bay it had to of been in the upper 90’s today and the wind finally stopped! That wind was crazy!! Have a great week and good luck on your finals! 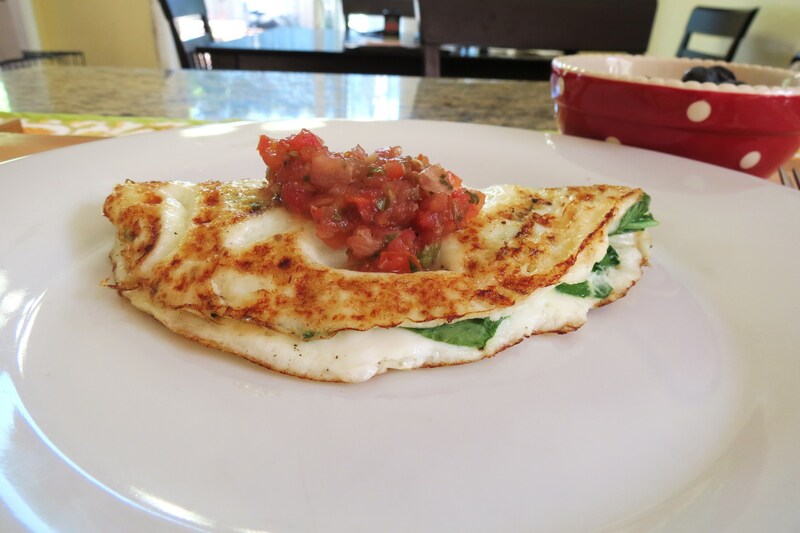 I love egg white omelettes! Cream cheese and chive is my favorite! I did the same thing years ago at a resort we stayed at in Colorado Springs – I stared at the chefs behind the omelet station until I had their technique down-pat! 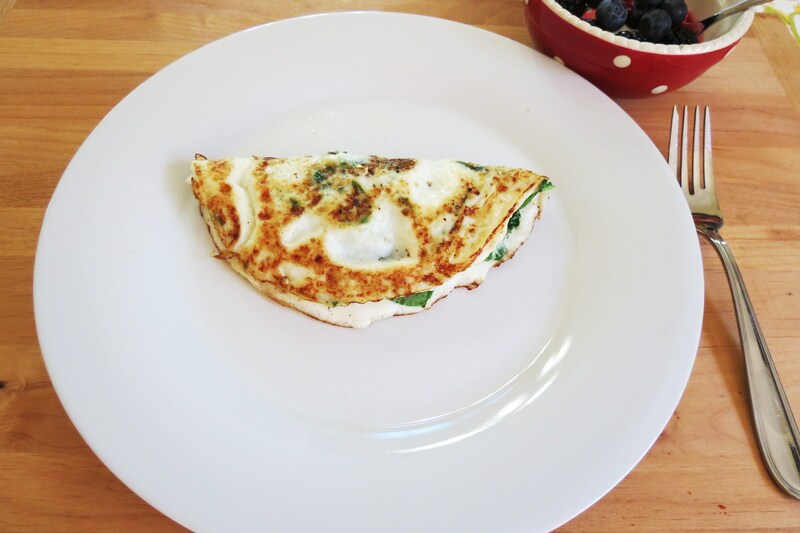 I love your egg-white version, wonderful for a high protein, low fat breakfast! 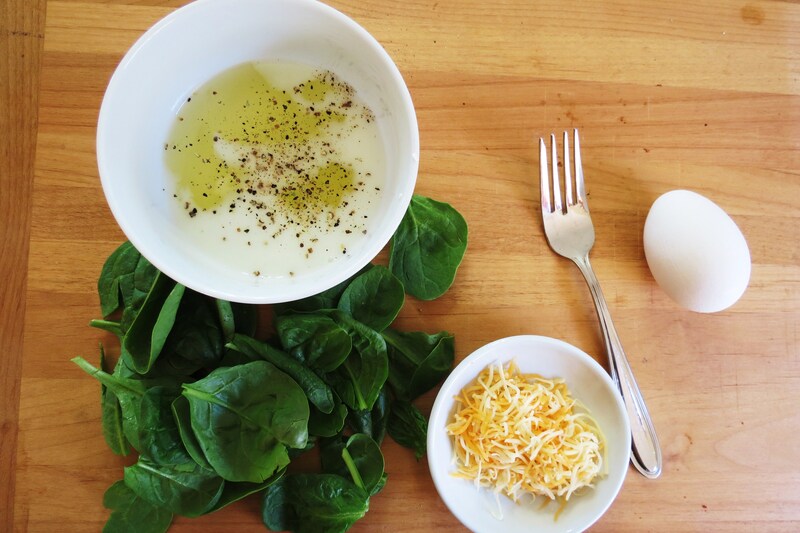 YUM, love the spinach and cheese! Great photos too! Thanks for the lesson, I too, always seem to end up with scrambled eggs! I think we end up with scrambled eggs because were not patient and were afraid the egg will burn! At least that was it for me!! Glad I finally got it down!! This is a great how-to and the pics are delicious! Thanks for the inspiration for tonight’s entree. Oh, and salsa works for just about anything, it’s great! I love a simple dinner and who says you can’t have eggs for breakfast? I think it’s perfect!! What kind of omelet did you make? I heart egg white omelets. So versatile and filling and healthy! I agree! There my favorite and now there fun to make!!! Me too! And so easy, and you can add anything to them. I always start preparing omelets and end up with scrambled eggs! I always try to make the half-moon shape in the pan, but have never been successful at it. Maybe I’m too hungry and don’t wait enough time for the eggs to be firm, hehe. Thanks for the great lesson. I know what you mean. One of my readers said they fold it over in the pan. Thats to advanced for me, I have a hard enough time now. Jen, you’re a genious! I did it! I followed your instructions and I was finally able to do it. I even folded it in the pan! Thank you, thank you! Can’t wait to make one for my fiancé. Yah! I am so happy it worked out for you!!! 🙂 Oh, and you go, with folding in the pan!! Nice job!! I’m so happy that you put this up! I ran out of oatmeal today (which has been my go-to breakfast for weeks), so I decided to try making an omelet using your techniques. I used whole eggs instead of egg whites (I have an issue using egg whites…I never know how to use the yolks and they go to waste), and added in about 2 oz of turkey slices. 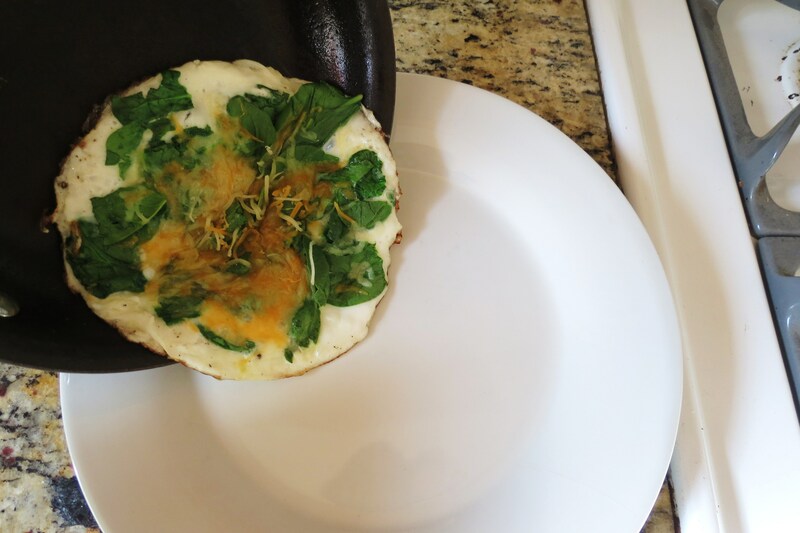 I’m usually not a big fan of spinach, but this was a very sneaky way of incorporating it into breakfast and I LOVED it! Thanks, Jen! Your welcome! So glad it turned out!! Your omelet sounds good!!! I have to try it adding turkey in it!! Yum! !